Come join the fun! “Hello Sunshine” Block of the Month Wall Hanging! Guaranteed to brighten up winter days! Come make this Adorable, Fun Quilt and see what you can create on your Embroidery Machine! You will learn new techniques that you make in the hoop that are fun and easy! Hello Sunshine! Hello Bicycle days! Hello Pinwheels and Pineapples! Dimensional embellishments like Chenille, Fringe and Felt Flowers, even Pinwheels and Mylar balloons are made in the hoop! Learn the easy method for Prairie Points, Ruching, and Piecing the Windmill Block. 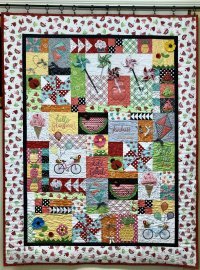 Pinwheel Wishes Wall Hanging and Bicycle Bliss Bench Pillow. Quilt measures 52” x 67”. The “Hello Sunshine “class will meet once a month for 6 to 9 months depending on participants progress. We will meet until our project is quilted and after to add the embellishments. This will be such a fun class. I will be happy to add another class should the first class fills up. Only 4 people per class. Craig has generously offered to have machines availabile to use so you don’t have to bring your machine. You will need to bring your threads and stabilizer etc. Looking forward to seeing you! Sign up soon! All classes are check or cash only. Sorry, no credit cards.